As a writer who gained fame primarily by capturing a cultural moment that has long since passed, Jack Kerouac (1922–1969) could easily have faded from consciousness. He was, and remains, best known for his novel On the Road, published in 1957, whose popularity was one of the early signs of widespread cultural rebellion among American youth. But Kerouac and that rebellion soon parted ways; unlike his friend Allen Ginsberg, he never made the transition to the very different cultural atmosphere of the 1960s, and his alcohol-shortened life was over by that decade’s end. Since then, however, there has been a steady stream of biographies, academic studies, symposia, critical editions of his work, and references to Kerouac in likely and unlikely places. Two such references I chanced upon recently indicate the range: In a 2016 article on “spiritual hitchhiking,” Peter and Sharon Lauricella cite the Kerouac of On the Road as the prototype of the spiritual hitchhiker.1 In Quebec writer (and television presenter) Claudine Bourbonnais’s 2014 novel Métis Beach, Kerouac is a character who is always in the background and sometimes in the foreground. Bourbonnais’s protagonist is a Quebecer who undertakes his own journey across the United States, with a passage from Kerouac to send him on his way.2 Nearly half a century after his death, there can be little doubt that Kerouac is an enduring figure. Since the opening of the Kerouac archives at the New York Public Library in 2006, much previously unknown Kerouac material has come to light. Two noteworthy new collections of unpublished Kerouac writings give some clues to the reasons for his endurance. At the same time, his fondest wish was to escape his Quebec roots, to become a “real American man,” a wish that played out in his wild cross-country adventures with Neal Cassady that became the subject matter of On the Road. He also wanted to be a great American writer like his early role model, Thomas Wolfe, and he pursued that ambition with his first novel, The Town and the City (1950). But he was deeply affected by a review of that book that appeared in Le Travailleur, a newspaper based in Worcester, Massachusetts, whose mission was to uphold the traditional French-Canadian value of survivance, survival of the French language and Catholic religion in the Anglo-American Protestant sea. The reviewer, the noted Franco-American journalist Yvonne Le Maître, while favourable to the book, criticized Kerouac for hiding his French-Canadian ethnicity and his origins in a French-speaking family. In a letter to Le Maître, Kerouac told her of his desire to write novels in French and said that he refashioned English to fit French images. At the heart of both these new collections are two novellas that Kerouac wrote in French in the early 1950s, one entitled La nuit est ma femme (The Night is my Woman) and the other entitled Sur le chemin in French and Old Bull in the Bowery in English. Kerouac himself translated bits of the two novellas into English, and Jean-Christophe Cloutier has completed the translations. Cloutier, a native of Quebec who now teaches English at the University of Pennsylvania, also translated a few passages of Old Bull that were originally written in English into French. Cloutier’s work in bringing these novellas to publishable form went beyond editing and translation to something resembling archeology, like deciphering the inscription on an Assyrian stele or piecing together fragments of the Dead Sea Scrolls. This was especially true of Old Bull, much of which was found in pieces in various notebooks in the archives, handwritten and sometimes heavily revised. The French in which Kerouac wrote was not the French of Paris or even Montreal but the French he heard in his childhood in the homes and streets of Lowell. Its grammar is informal, its spelling is inconsistent and it is laced with English words, but like other popular varieties such as Yiddish and African American Vernacular English, it is powerfully expressive. Kerouac wrote in this language because for him “the language called Canadian French” was “the strongest in the world.” In this he differed from the joual writers of Quebec whose writing in working-class vernacular served a Quebec nationalist agenda. Kerouac’s agenda was simply to find the best vehicle for his memories and experiences. Il faut vivre en Anglais, c’est impossible vivre en Francais. This is the secret thought of the Canuck in America. C’est important aux Anglais – it’s important to the English … so the Canuck does it. And yet, despite Kerouac’s self-idenfication as a “Canuck,” his relationship with the actually existing Canada – French Canada – a few hundred kilometres from his native Lowell was always a rocky one. The quote above was inspired by a childhood trip to Montreal in 1934. A visit to Montreal at the height of his creative period in 1953 again left him disillusioned. And when he came to Montreal in 1967 he found himself completely out of step with the new Quebec of the Quiet Revolution. When he was interviewed on a Radio-Canada television show people laughed at the way he spoke French. Kerouac books and studies followed. In 1987 a “Rencontre internationale Jack Kérouac” brought American, Canadian and European scholars, along with surviving Beat writers Allen Ginsberg, William Burroughs and Lawrence Ferlinghetti, to Quebec City. In 2007 Le Devoir reviewer Michel Lapierre considered it “deplorable” that historian Yves Roby, in his book on the Franco-Americans, failed to mention Kerouac, “the writer who brought a breath of Quebec, attenuated though it may be, to the English language and American culture.”5 Claudine Bourbonnais’s evocation of Kerouac in her 2014 novel was another indication of the extent to which Kerouac has become a figure in the Quebec imagination. All that was left was for a major Quebec publisher to bring out a collection of Kerouac’s French writings – something that has now been accomplished thanks to Jean-Christophe Cloutier’s painstaking work. Although “sur le chemin” is French for “on the road,” the French novella with that title is not at all the same work as the novel published in 1957. In his 1951 journal, Kerouac refers repeatedly to a manuscript he is working on called On the Road, but that is not the 1957 On the Road either; it was published after his death as Visions of Cody. Clearly, “on the road” was more than a book title for Kerouac – it was an existential reality. He was eternally on the road: a spiritual hitchhiker, yes, but also an internally displaced person, uprooted from his old home and never able to find a new one. Victor-Lévy Beaulieu described Kerouac as “the cherry on the Franco-American sundae”6: the pinnacle, and at the same time the end. The Franco-American community could not have produced a Kerouac at any other time, for the institutional foundations of the rich French life in which Ti-Jean grew up were crumbling, and by the end of his life they were gone. In the years since, this sense of crumbling cultural foundations has become increasingly widespread. In 2016 many of us are internally displaced persons, even – no, especially – the “real American man,” whose cultural alienation has reached the point that he has allowed himself to be seduced by so unlikely a saviour as Donald Trump. The area around the VA Hospital in the Bronx where Kerouac began his 1951 journal is now predominantly Spanish-speaking, with overtones of Mexico and the Dominican Republic. I suspect that Kerouac – at least the early Kerouac, before he became hardened and cynical – would have enjoyed “sketching” (in words) this neighbourhood, but many others see in such places the loss of the America they once knew. “We must yield to the evidence,” writes Jean Christophe Cloutier. 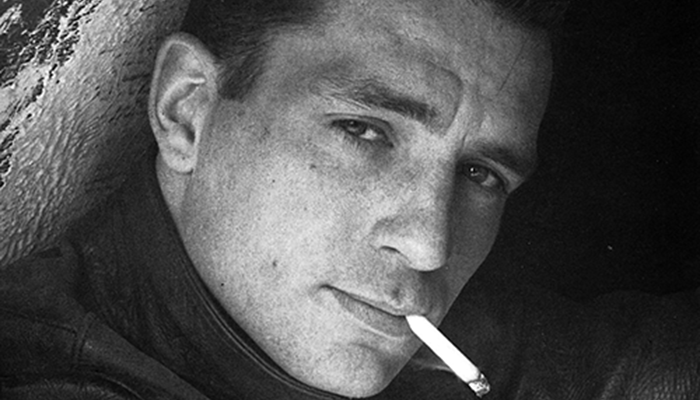 “Kerouac remains, above all, an American.” But what was perhaps most American about him was his duality, and it was only after he fully embraced this duality that he fulfilled his dream of becoming a great American writer. 1 Peter Lauricella and Sharon Lauricella, “Hitchhiking, Hospitality, and Spiritual Communities,” Cloverleaf, Vol. 1, No. 1 (July 2016), p. 26. 2 Montreal: Boréal, 2014. An English translation by Jacob Homel has just been published (Toronto: Dundurn, 2016). 3 Quoted in Ann Charters, Kerouac (San Francisco: Straight Arrow Books, 1973), p. 307. 4 Victor-Lévy Beaulieu, Jack Kerouac: A Chicken-Essay (Toronto: Coach House Press, 1975), p. 148; translation by Sheila Fischman of Jack Kérouac: essai-poulet (Montreal: Éditions du Jour, 1972). 5 Michel Lapierre, “Histoire – La tragédie du Québec états-unien,” Le Devoir, August 11, 2007. 6 Beaulieu, Jack Kerouac: A Chicken-Essay, p. 14.